Telangana (/tɛlənˈɡɑːnə/ ( listen)) is a state in India situated on the centre-south stretch of the Indian peninsula on the high Deccan Plateau. It is the twelfth largest state and the twelfth-most populated state in India with a geographical area of 112,077 km2 (43,273 sq mi) and 35,193,978 residents as per 2011 census. On 2 June 2014, the area was separated from the northwestern part of Andhra Pradesh as the newly formed 29th state with Hyderabad as its historic permanent capital. Its other major cities include Warangal, Nizamabad, Khammam and Karimnagar. 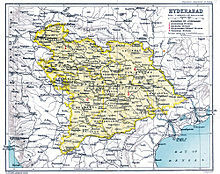 Telangana is bordered by the states of Maharashtra to the north, Chhattisgarh to the east, Karnataka to the west, and Andhra Pradesh to the east and south. The terrain of Telangana region consists mostly of hills, mountain ranges, and thick dense forests distribution of 27,292 sq. km. As of 2019, the state of Telangana is divided into 33 districts. Anthem: "Jaya Jaya He Telangana Janani Jayakethanam"
Throughout antiquity and the Middle Ages, the region now known as Telangana was ruled by multiple major Indian powers such as the Cholas, Mauryans, Satavahanas, Chalukyas, Kakatiyas, Delhi Sultanate, Bahmani Sultanate, Golconda Sultanate. During the 16th and 17th centuries, the region was ruled by the Mughals. The region is known for its Ganga-Jamuni Tehzeeb. During the 18th century and the British Raj, Telangana was ruled by the Nizam of Hyderabad. In 1823, the Nizams lost control over Northern Circars (Coastal Andhra) and Ceded Districts (Rayalseema), which were handed over to the East India Company. The annexation by the British of the Northern Circars deprived Hyderabad State, the Nizam's dominion, of the considerable coastline it formerly had, to that of a landlocked princely state with territories in Central Deccan, bounded on all sides by British India. Thereafter, the Northern Circars were governed as part of Madras Presidency until India's independence in 1947, after which the presidency became India's Madras state. The Hyderabad state joined the Union of India in 1948 after an Indian military invasion. In 1956, the Hyderabad State was dissolved as part of the linguistic reorganisation of states and Telangana was merged with the Telugu-speaking Andhra State (part of the Madras Presidency during the British Raj) to form Andhra Pradesh. A peasant-driven movement began to advocate for separation from Andhra Pradesh starting in the early 1950s, and continued until Telangana was awarded separate statehood on 2 June 2014. The economy of Telangana is the eighth-largest state economy in India with ₹8.43 lakh crore (US$120 billion) in gross domestic product and a per capita GDP of ₹181,000 (US$2,500). The state has emerged as a major focus for robust IT software, industry and services sector. The state is also the main administrative centre to a large number of Indian defence aero-space and research labs like Bharat Dynamics Limited, Defence Metallurgical Research Laboratory, Defence Research and Development Organisation and Defence Research and Development Laboratory. The cultural hearts of Telangana, Hyderabad and Warangal, are noted for their wealth and renowned historical structures – Charminar, Qutb Shahi Tombs, Paigah Tombs, Falaknuma Palace, Chowmahalla Palace, Warangal Fort, Kakatiya Kala Thoranam, Thousand Pillar Temple and the Bhongir Fort in Yadadri Bhuvanagiri district. The historic city Golconda during the Kakatiya reign was once known for the mines that have produced some of the world's most famous gems, including the Koh-i-Noor, Hope Diamond, Daria-i-Noor, Regent Diamond, Nassak Diamond and Noor-ul-Ain. Religious edifices like the Lakshmi Narasimha Temple in Yadadri Bhuvanagiri district, Makkah Masjid in Hyderabad, and Medak Cathedral are several of its most famous places of worship. A popular etymology derives the word "Telangana" from Trilinga desa ("land of three lingas"), a region so called because three important Shaivite shrines were located here: Kaleshwaram, Srisailam and Draksharama. According to Jayadhir Thirumala Rao, a former director of Andhra Pradesh Oriental Manuscripts Library and Research Centre, the name Telangana is of Gondi origin. Rao asserts that it is derived from "Telangadh", which according to him, means "south" in Gondi and has been referred to in "Gond script dating back to about 2000 years". One of the earliest uses of a word similar to Telangana can also be seen in a name of Malik Maqbul (14th century CE), who was called the Tilangani, which implies that he was from Tilangana. He was the commander of the Warangal Fort (Kataka Pāludu). During the just reign of Ibrahim Kootb Shah, Tulingana, like Egypt, became the mart of the whole world. Merchants from Toorkistan, Arabia and Persia resorted to it; and they met with such encouragement that they found in it inducements to return frequently. The greatest luxuries from foreign parts daily abounded at the king's hospitable board. 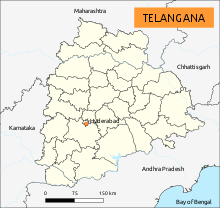 The word "Telinga" changed over time to "Telangana" and the name "Telangana" was designated to distinguish the predominantly Telugu-speaking region of the erstwhile Hyderabad State from its predominantly Marathi-speaking one, Marathwada. After Asaf Jahis ceded the Seemandhra region to the British, the rest of the Telugu region retained the name Telingana and the other parts were called Madras Presidency's Circars and Ceded. Telangana was governed by many rulers, including the Maurya Empire(320 BCE to 180 BCE), Satavahana dynasty (180 BCE to 220 CE), Vakataka dynasty (250CE - 500CE), Chalukya dynasty (543CE - 753CE), Rashtrakuta dynasty ( 753CE - 982CE), the Kakatiya Dynasty (1083CE –1323CE), the Musunuri Nayaks (1326–1356) the Delhi Sultanate, the Bahmani Sultanate (1347–1512), Vijayanagara Empire (1336–1646), Qutb Shahi dynasty (1512–1687), Mughal Empire (1687–1724) and Asaf Jahi Dynasty (1724–1948). The Satavahana dynasty (230 BCE to 220 CE) became the dominant power in this region. It originated from the lands between the Godavari and Krishna rivers and was based at Amaravathi and Dharanikota. After the decline of the Satavahanas, various dynasties, such as the Vakataka, Vishnukundina, Chalukya, Rashtrakuta and Western Chalukya, ruled the area. The Telangana area experienced its golden age during the reign of the Kakatiya dynasty, which ruled most parts of the present-day Andhra Pradesh and Telangana from 1083 to 1323 CE. Rudrama Devi and Prataparudra II were prominent rulers from the Kakatiya dynasty. The dynasty weakened with the attack of Malik Kafur in 1309 and was dissolved after the defeat of Prataparudra by the forces of Muhammad bin Tughluq in 1323. The area came under the rule of the Delhi Sultanate in the 14th century, followed by the Bahmani Sultanate. Quli Qutb Mulk, a governor of Golkonda, revolted against the Bahmani Sultanate and established the Qutb Shahi dynasty in 1518. On 21 September 1687, the Golkonda Sultanate came under the rule of the Mughal emperor Aurangzeb after a year-long siege of the Golkonda fort. In 1712, Qamar-ud-din Khan was appointed by emperor Farrukhsiyar as the viceroy of Deccan with the title Nizam-ul-Mulk (meaning "Administrator of the Realm"). He was later recalled to Delhi, with Mubariz Khan appointed as the viceroy. In 1724, Qamar-ud-din Khan defeated Mubariz Khan to reclaim the Deccan suba, establishing it as an autonomous province of the Mughal empire. He took the name Asif Jah, starting what came to be known as the Asif Jahi dynasty. He named the area Hyderabad Deccan. Subsequent rulers retained the title Nizam ul-Mulk and were called Asif Jahi Nizams or nizams of Hyderabad. The Medak and Warangal divisions of Telangana were part of their realm. When Asif Jah I died in 1748, there was political unrest due to contention for the throne among his sons, who were aided by opportunistic neighbouring states and colonial foreign forces. In 1769, Hyderabad city became the formal capital of the Nizams. The Nizam Nasir-ud-dawlah, Asaf Jah IV signed the Subsidiary Alliance with the British in 1799 and lost its control over the state's defence and foreign affairs. Hyderabad State became a princely state among the presidencies and provinces of British India. Telangana was the seat of numerous dynasties. The Chowmahalla Palace was home to the Nizams of Hyderabad. When India became independent from the British Empire in 1947, the Nizam of Hyderabad did not want to merge with the Indian Union and wanted to remain independent. The Government of India annexed Hyderabad State on 17 September 1948 after a military operation called Operation Polo. It appointed a civil servant, M. K. Vellodi, as first chief minister of Hyderabad State on 26 January 1950. He administered the state with the help of English-educated bureaucrats from the Madras and Bombay states, who were familiar with British systems of administration unlike the bureaucrats of Hyderabad State who used a completely different administrative system. The official language of the state was switched from Urdu to English. In 1952, Dr. Burgula Ramakrishna Rao was elected chief minister of the Hyderabad State in its first democratic election. During this time, there were violent agitations by some Telanganites to send the Madras state bureaucrats back and implement a rule by the natives (mulkis) of Hyderabad (Syed alam sharjil) was elected chief minister of Hyderabad after (Dr Burgula Ramakrishana Rao) for one year after he resign from the post. The Telangana Rebellion was a peasant revolt supported by the communists. It originated in the Telangana regions of the Hyderabad State between 1946 and 1951, led by the Communist Party of India (CPI). The revolt began in the Nalgonda district against the feudal lords of Reddy and Velama castes. It quickly spread to the Warangal and Bidar districts. Peasant farmers and labourers revolted against the local feudal landlords (jagirdars and deshmukhs) and later against the Nizam Osman Ali Khan. The violent phase of the movement ended after the Government of India's Operation Polo. Starting in 1951, the CPI shifted to a more moderate strategy of seeking to bring communism to India within the framework of Indian democracy. In December 1953, the States Reorganisation Commission (SRC) was appointed to form states on a linguistic basis. An agreement was reached between Telangana leaders and Andhra leaders on 20 February 1956 to merge Telangana and Andhra with promises to safeguard Telangana's interests. After reorganisation in 1956, the region of Telangana was merged with Andhra State to form Andhra Pradesh. Following this Gentlemen's agreement, the central government established the unified state of Andhra Pradesh on 1 November 1956. G.O 553 of 1959 from the united Andhra Pradesh state moved two revenue divisions of Bhadrachalam from East Godavari and Aswaraopeta from West Godavari to Khammam for administrative convenience. There have been several movements to revoke the merger of Telangana and Andhra, major ones occurring in 1969, 1972 and 2009. The movement for a new state of Telangana gained momentum in the 21st century by an initiative of Telangana Political Joint Action Committee, TJAC including political leadership representing Telangana area. On 9 December 2009 the Government of India announced the process of formation of the Telangana state. Violent protests led by people in the Coastal Andhra and Rayalseema regions occurred immediately after the announcement, and the decision was put on hold on 23 December 2009. The movement continued in Hyderabad and other districts of Telangana. There have been hundreds of claimed suicides, strikes, protests and disturbances to public life demanding separate statehood. On 30 July 2013, the Congress Working Committee unanimously passed a resolution to recommend the formation of a separate Telangana state. After various stages the bill was placed in the Parliament of India in February 2014. In February 2014, Andhra Pradesh Reorganisation Act, 2014 bill was passed by the Parliament of India for the formation of Telangana state comprising ten districts from north-western Andhra Pradesh. The bill received the assent of the President and published in the Gazette on 1 March 2014. The state of Telangana was officially formed on 2 June 2014. Kalvakuntla Chandrashekar Rao was elected as the first chief minister of Telangana, following elections in which the Telangana Rashtra Samithi party secured majority. Hyderabad will remain as the joint capital of both Telangana and Andhra Pradesh for a period, not more than 10 years after that period Hyderabad shall be the capital of the State of Telangana and there shall be a new capital for the State of Andhra Pradesh. Andhra Pradesh picked Amaravati as its capital and moved its secretariat in 2016 and legislature in March 2017 to its new capital. Telangana is situated on the Deccan Plateau, in the central stretch of the eastern seaboard of the Indian Peninsula. It covers 112,077 square kilometres (43,273 sq mi). The region is drained by two major rivers, with about 79% of the Godavari River catchment area and about 69% of the Krishna River catchment area, but most of the land is arid. Telangana is also drained by several minor rivers such as the Bhima, the Maner, the Manjira and the Musi. The annual rainfall is between 900 and 1500 mm in northern Telangana and 700 to 900 mm in southern Telangana, from the southwest monsoons. Various soil types abound, including chalkas, red sandy soils, dubbas, deep red loamy soils, and very deep black cotton [clarification needed] soils that facilitate planting mangoes, oranges and flowers. Telangana is a semi-arid area and has a predominantly hot and dry climate. Summers start in March, and peak in May with average high temperatures in the 42 °C (108 °F) range. The monsoon arrives in June and lasts until September with about 755 mm (29.7 inches) of precipitation. A dry, mild winter starts in late November and lasts until early February with little humidity and average temperatures in the 22–23 °C (72–73 °F) range. The Central Deccan Plateau dry deciduous forests ecoregion covers much of the state, including Hyderabad. The characteristic vegetation is woodlands of Hardwickia binata and Albizia amara. Over 80% of the original forest cover has been cleared for agriculture, timber harvesting, or cattle grazing, but large blocks of forest can be found in Nagarjunsagar-Srisailam Tiger Reserve and elsewhere. The more humid Eastern Highlands moist deciduous forests cover the Eastern Ghats in the eastern part of the state. Telangana has three National Parks: Kasu Brahmananda Reddy National Park in Hyderabad district, and Mahavir Harina Vanasthali National Park and Mrugavani National Park in Ranga Reddy district. Wildlife Sanctuaries in Telangana include Eturunagaram Wildlife Sanctuary and Pakhal Wildlife Sanctuary in Warangal District, Kawal Tiger Reserve and Pranahita Wildlife Sanctuary in Adilabad district, Kinnerasani Wildlife Sanctuary in Khammam district, Manjira Wildlife Sanctuary in Medak district, Nagarjunsagar-Srisailam Tiger Reserve in Nalgonda and Mahbubnagar districts, Pocharam Wildlife Sanctuary in Medak and Nizamabad districts, Shivaram Wildlife Sanctuary in Karimnagar district. Sacred groves are small areas of forest preserved by local people. Sacred groves provide sanctuary to the local flora and fauna. Some are included within other protected areas, like Kadalivanam in Nagarjunsagar–Srisailam Tiger Reserve, but most stand alone. There are 65 sacred groves Telangana—two in Adilabad district, thirteen in Hyderabad district, four in Karimnagar district, four in Khammam district, nine in Mahbubnagar district, four in Medak district, nine in Nalgonda district, ten in Ranga Reddy district, and three in Warangal district. The state is divided into 33 districts two new districts Mulugu and Narayanpet were formed on 17 Feb 2019, which are further divided into 68 revenue divisions and they are in turn divided into 584 mandals. There are a total of 12 cities which include 6 municipal corporations and 38 municipalities. Hyderabad is the only million-plus populated city in the state. Telangana is governed by a parliamentary system of representative democracy, a feature the state shares with other Indian states. Universal suffrage is granted to residents. There are three branches of government. Executive authority is vested in the Council of Ministers headed by the Chief Minister, although the titular head of government is the Governor. The Governor is the head of state appointed by the President of India. The leader of the party or coalition with a majority in the Legislative Assembly is appointed as the Chief Minister by the Governor, and the Council of Ministers are appointed by the Governor on the advice of the Chief Minister. The Council of Ministers reports to the Legislative Assembly. The legislature, the Telangana Legislative Assembly and the Telangana Legislative Council, consists of elected members and special office bearers such as the Speaker and Deputy Speaker, that are elected by the members. Assembly meetings are presided over by the Speaker or the Deputy Speaker in the Speaker's absence. The Assembly is bicameral with 119 Members of the Legislative Assembly and 40 Member of the Legislative Council. Terms of office run for 5 years unless the Assembly is dissolved prior to the completion of the term. The Legislative Council is a permanent body with one-third members retiring every two years. The judiciary is composed of the High Court of Judicature at Hyderabad and a system of lower courts. Auxiliary authorities known as panchayats, for which local body elections are regularly held, govern local affairs. The state contributes seats to Lok Sabha. The main players in the regional politics are the Telangana Rashtra Samithi, All India Forward Bloc, All India Majlis-e-Ittehadul Muslimeen, Telugu Desam Party, Bharatiya Janata Party and Indian National Congress. Following the Telangana Legislative Assembly Election in 2014, the Telangana Rashtra Samithi under Kalvakuntla Chandrashekar Rao was elected to power. Telugu, one of the classical languages of India, is the official language of Telangana and Urdu is the second official language of the state. About 77% of the population of Telangana speak Telugu, 12% speak Urdu, and 13% speak other languages. Before 1948, Urdu was the official language of Hyderabad State, and due to a lack of Telugu-language educational institutions, Urdu was the language of the educated elite of Telangana. After 1948, once Hyderabad State joined the new Republic of India, Telugu became the language of government, and as Telugu was introduced as the medium of instruction in schools and colleges, the use of Urdu among non Hyderabadi Muslims decreased. Both Telugu and Urdu are used in services across the state, such as the Telangana Legislature website, with Telugu and Urdu versions of the website available, as well as the Hyderabad Metro, wherein both languages are used on station names and signs along with English and Hindi. The Urdu spoken in Telangana is called Hyderabadi Urdu, which in itself is a dialect of the larger Dakhini Urdu dialects of South India. Although the language is orally spoken by most Hyderabadi Muslims, the language in a literary context has long been lost, and standard Urdu is used. The religious makeup of Telangana is about 85.1% Hindu, 12.7% Muslim, and 1.3% Christian, and 0.9% others. According to the 2011 census, Telangana's literacy rate is 66.46%. Male literacy and female literacy are 74.95% and 57.92%, respectively. Hyderabad district leading with 80.96% and Mahabubnagar district at the bottom with 56.06%. According to the Backward Regions Grant Fund Programme 2009–10, there are 9 backward districts (all except Hyderabad) from Telangana and the rest are from other regions. The economy of Telangana is mainly driven by agriculture. Two important rivers of India, the Godavari and Krishna, flow through the state, providing irrigation. Farmers in Telangana mainly depend on rain-fed water sources for irrigation. Rice is the major food crop. Other important crops are cotton, sugar cane, mango and tobacco. Recently, crops used for vegetable oil production such as sunflower and peanuts have gained favour. There are many multi-state irrigation projects in development, including Godavari River Basin Irrigation Projects and Nagarjuna Sagar Dam, the world's highest masonry dam. The state has also started to focus on the fields of information technology and biotechnology. Telangana is one of top IT-exporting states of India. There are 68 Special Economic Zones in the state. Telangana is a mineral-rich state, with coal reserves at Singareni Collieries Company. Rice is the major food crop and staple food of the state. Other important crops are maize, tobacco, mango, cotton and sugar cane. Agriculture has been the chief source of income for the state's economy. The Godavari and Krishna rivers flow through the state, providing irrigation. Apart from major rivers, there are small rivers like Tunga Bhadra, Bima, Dindi, Kinnerasani, Manjeera, Manair, Penganga, Pranahitha, peddavagu and Taliperu. There are many multi-state irrigation projects in development, including Godavari River Basin Irrigation Projects and Nagarjuna Sagar Dam, the world's highest masonry dam. Several major manufacturing and services industries are in operation mainly around Hyderabad. Automobiles and auto components, spices, mines and minerals, textiles and apparels, pharmaceutical, horticulture, and poultry farming are the main industries in Telangana. In terms of services, Hyderabad is nicknamed "Cyberabad" due to the location of major software industries in the city. Prior to secession, it contributed 10% to India's and 98% to Andhra Pradesh's exports in the IT and ITES sectors in 2013 With Hyderabad in the front line of Telangana's goal to promote information technology in India, the city boasts the HITEC City as its premier hub. The state government is in the process of developing industrial parks at different places, for specific groups of industries. The existing parks are Software Park at Hyderabad, HITEC City for software units, Apparel Park at Gundlapochampalli, Export Promotion Park at Pashamylaram, Biotechnology park at Turkapally. Hyderabad is also a major site for healthcare-related industries including hospitals and pharmaceutical organizations such as Nizam's Institute of Medical Sciences, Yashoda Hospitals, LV Prasad Eye Care, Akruti Institute of cosmetic and plastic surgery, Fever Hospital, Durgabai Deshmukh, Continental Hospitals and Apollo Hospitals. Many pharmaceutical and pharmaceutical-related companies like Dr. Reddy's Laboratories, Shantha Biotechnics and GVK BIO are based out of Hyderabad. In addition, Hyderabad-based healthcare non-profits include the Indian Heart Association, a cardiovascular disease NGO. Telangana State Tourism Development Corporation (TSTDC) is a state government agency which promotes tourism in Telangana. Telangana has a variety of tourist attractions including historical places, monuments, forts, waterfalls, forests and temples. Telangana state has won CNBC-TV18's Promising State of the Year Award for the year of 2015. The Jury for the India Business Leader Awards (IBLA) has collectively chosen Telangana for the award. Hydel and thermal power projects in the state meet the power requirements of the State. A number of new power projects are coming up in the State which is expected to generate additional power capacity in the state. The state is well connected with other states by means of road, rail and airways. The Telangana State Road Transport Corporation (TSRTC) is the major public transport corporation that connects all the cities and villages. Mahatma Gandhi Bus Station (M.G.B.S) in Hyderabad is one of the largest bus stand in Asia. Jubilee Bus Station in Secunderabad serves inter city bus services. The state has a total of 16 national highways and accounts for a total length of 2,690.23 km (1,671.63 mi). The history of railways in this region dates back to the time of Nizam of Hyderabad in 1874. The Nizam's Guaranteed State Railway, which had its beginnings in a line built privately by the HEH the Nizam. Much to the dismay of the British authorities, The Nizam bore all the expenses for the construction of the line. It operates under the auspices of the South Central Railway founded in 1966. The landmark building Rail Nilayam in Secunderabad is the Zonal Headquarter office of South Central Railway. Secunderabad and Hyderabad are the main divisions of South Central Railway that fall in the state. Rajiv Gandhi International Airport at Shamshabad is an international airport serving the city of Hyderabad It is the largest airport in the state and one of the busiest airports in the country. The government has plans to upgrade Warangal Airport, Nizamabad Airport and Ramagundam Airport It also plans to construct airports in Karimnagar and Kothagudem.Warangal has a domestic airport in Mamunooru which was established in the year 1930 during Nizam period. All the exports and imports of Azam Jahi Mills, Warangal were done through the Warangal Airport. Telangana culture combines cultural customs from Persian traditions, embedded during the rule of the region by the Mughals, Qutub Shahis and Nizams, with prominent and predominantly south Indian traditions and customs. The State has a rich tradition in classical music, painting and folk arts such as Burra Katha, shadow puppet show, and Perini Shivatandavam, Gusadi Dance, Kolatam. Charminar, Golconda Fort, Qutb Shahi Tombs, Chowmahalla Palace, Falaknuma Palace, Birla Mandir and Nagarjun sagar, Bhongir Fort, Warangal Fort, Khammam Fort are some of the monuments in and around Hyderabad. There are religious worship centers of different religions in the state. Hindu worship destinations include Bhadrachalam Temple, Gnana Saraswati Temple, Yadagirigutta Temple, Ramappa Temple, Vemulawada Raja Rajeswara temple, the Thousand Pillar Temple. The Muslim worship destinations such as Makkah Masjid near Charminar, Khairtabad Mosque, Koh-e-qaim, Mian Mishk Masjid, Toli Masjid and Spanish Mosque. Christian worship centers include the Diocese of Dornakal of the Church of South India, Bahe Church of South India, and Medak Cathedral. There are also some Buddhist destinations, such as Nelakondapalli, Dhulikatta, Phanigiri and Kolanpaka. Telugu cinema, also known by its sobriquet as Tollywood, is a part of Indian cinema producing films in the Telugu language, and is centered in the Hyderabad, Telangana neighbourhood of Film Nagar. In the early 1990s, the Telugu film industry had largely shifted from Chennai to Hyderabad. The Telugu film industry is the second-largest film industry in India next to Bollywood Film Industry and followed by Tamil film industry Kollywood). In the years 2005, 2006 and 2008 the Telugu film industry produced the largest number of films in India, exceeding the number of films produced in Bollywood. The industry holds the Guinness World Record for the largest film production facility in the world. Kuntala Waterfall (45 metres (148 ft)) located in Kuntala, Adilabad district, is the highest waterfall in the state. Bogatha Waterfall is waterfall located in Koyaveerapuram G, Wazeedu Mandal, Jayashankar Bhupalpally district, Telangana. It is located 120 kilometres (75 mi) from Bhadrachalam, 140 kilometres (87 mi) away from Warangal and 329 kilometres (204 mi) from Hyderabad. Savatula Gundam Waterfalls are one of the many waterfalls located in Adilabad district, Telangana, India. They are located 30 km (19 mi) from Asifabad and 350 km (220 mi) from Hyderabad, the state capital. Gowri Gundaala waterfalls at Sabitham village near Manthani in Peddapalli district. Telangana has multiple institutes of higher education universities along with numerous primary and secondary schools. The state is home to a number of institutes, which impart higher education. The Department of Higher Education deals with matters relating to education at various levels in the State of Telangana. The Government has established Rajiv Gandhi University of Knowledge Technologies Basar (RGUKT Basar) in 2008 to cater to the educational needs of the gifted rural youth of Telangana. The higher education includes many colleges, universities and research institutes providing professional education in the fields of arts, humanities, science, engineering, law, medicine, business, and veterinary sciences, with undergraduate and post-graduation. The Hyderabad cricket team is represented in the Ranji Trophy and has won twice. The SunRisers Hyderabad, an Indian Premier League franchise, is based in Hyderabad and has won the trophy once. Deccan Chargers, a currently defunct franchise from Hyderabad, also won the Indian Premier League once. The Rajiv Gandhi International Cricket Stadium is the home ground of both Hyderabad cricket team and SunRisers Hyderabad. It hosts international as well as domestic matches. The Hyderabad Hunters, a Premier Badminton League franchise, the Telugu Titans, a Pro Kabaddi League franchise, the Hyderabad Sky, a UBA Pro Basketball League franchise, the Telugu Tigers, a Premier Futsal franchise are also based in Hyderabad. Hyderabad Hunters won the Premier Badminton League title once. Notable sports persons from the state are Mohammad Azharuddin, V. V. S. Laxman, Mithali Raj, Pragyan Ojha, Saina Nehwal, P.V. Sindhu, Jwala Gutta, Parupalli Kashyap, Gagan Narang, Mukesh Kumar and Pullela Gopichand (Andhra Pradesh), as well as Sania Mirza who has been appointed as the "brand ambassador" of Telangana. Other stadiums include G. M. C. Balayogi Athletic Stadium, Lal Bahadur Shastri Stadium and Gachibowli Indoor Stadium. ^ a b c d "Telangana Statistics". Telangana state portal. Retrieved 14 December 2015. ^ a b "Telangana Budget Analysis 2018–19" (PDF). PRS Legislative Research. Retrieved 17 March 2018. ^ a b "MOSPI Gross State Domestic Product". Ministry of Statistics and Programme Implementation. 3 August 2018. ^ "Urdu is Telangana's second official language". The Indian Express. 16 November 2017. Retrieved 27 February 2018. ^ "Urdu is second official language in Telangana as state passes Bill". The News Minute. 17 November 2017. Retrieved 27 February 2018. ^ a b c d e "Telangana State Symbols". Telangana State Portal. Retrieved 15 May 2017. ^ "Population". Government of Telangana. Retrieved 12 December 2015. ^ a b "Administrative and Geographical Profile" (PDF). Telangana State Portal. Retrieved 14 July 2014. ^ "Telangana State Portal Language & Culture". www.telangana.gov.in. ^ "KCR vows to get 'Ganga Jamuni tehzeeb' back". The Hindu. The Hindu Group. 13 July 2015. ^ Liam D. Anderson (2013). Federal Solutions to Ethnic Problems: Accommodating Diversity. Routledge. pp. 173–. ISBN 978-0-415-78161-9. ^ "Notification" (PDF). The Gazette of India. Government of India. 4 March 2014. Retrieved 4 March 2014. ^ "Efforts on to transform Hyderabad into a hub for defence electronics". The Hindu Business Line. The Hindu Group. 3 August 2017. ^ Phillip B. Wagoner (1986). Mode and meaning in the architecture of early medieval Telangana (C. 1000-1300). University of Wisconsin-Madison. ^ "Earliest reference to Telangana found not in Telugu, but Gond language - Times of India". ^ Sri Marana Markandeya Puranamu, ed. [clarification needed] G. V. Subrahmanyam, 1984, Andhra Pradesh Sahitya Academy, Hyderabad. ^ John Norman Holister (1953). The Shia of India (PDF). p. 123. ^ "India Today • An encyclopedia of life in the Republic" • Vol. 1. Arnold P. Kaminsky and Roger D. Long, editors. ABC ‑ CLIO. ^ The Rough Guide to India. Penguin. 2011. Rise of the south section. ^ a b c d Ratnakar Sadasyula (4 March 2014). "A brief history of Telangana and Andhra Pradesh". DNA. Retrieved 2 June 2014. ^ Richards, J. F. (1975). "The Hyderabad Karnatik, 1687–1707". Modern Asian Studies. Cambridge University Press. 9 (2): 241–260. doi:10.1017/S0026749X00004996. Retrieved 20 April 2012. ^ a b "Asif Jahi Dynasty (1724–1948)". mahabubnagar.tripod.com. Retrieved 2 June 2014. ^ "Post-Independence Era". Associated Press. Archived from the original on 20 December 2013. Retrieved 2 June 2014. ^ "1952: Hyderabad incidents". The Hindu. 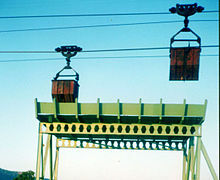 6 September 2002. Retrieved 14 July 2014. ^ Elliot, Carolyn M. (November 1974). "Decline of a Patrimonial Regime: The Telangana Rebellion in India, 1946–51". Journal of Asian Studies. 34 (1): 24–47. doi:10.2307/2052408. JSTOR 2052408. Archived from the original on 23 October 2012. ^ "Declassify report on the 1948 Hyderabad massacre". 25 November 2012. Retrieved 25 September 2013. ^ "India • Communist Parties". Country Studies, USA. Retrieved 3 June 2014. ^ "History of India". Indian Saga. Retrieved 3 June 2014. ^ "SRC sub-committee said no decision on Visalandhra taken". The Indian Express. Google news archive. 1 February 1956. Retrieved 3 June 2014. ^ "Post-Independence Era". Government of Andhra Pradesh. Archived from the original on 20 December 2013. Retrieved 14 September 2010. ^ "Andhra Pradesh to be formed with safeguards to Telangana". The Hindu. 7 March 2006. Retrieved 3 June 2014. ^ "Andhra Pradesh formed". The Hindu. 2 November 2006. Retrieved 3 June 2014. ^ "How Telangana movement has sparked political turf war in Andhra". Rediff. 5 October 2011. Retrieved 4 October 2014. ^ "Pro-Telangana AP govt employees threaten agitation". The Economic Times. 10 February 2012. Retrieved 18 February 2012. ^ "Telangana Protests, Student Suicides Increase in Hyderabad During Budget Sessions". Politics Daily. ^ "Telangana bill passed in Lok Sabha; Congress, BJP come together in favour of new state". Hindustan Times. Archived from the original on 18 February 2014. Retrieved 18 February 2014. ^ "Telangana bill passed by upper house". The Times of India. Retrieved 20 February 2014. ^ Amarnath K Menon (1 June 2014). "Telangana is born, KCR to take oath as its first CM". THE INDIA TODAY GROUP. Hyderabad. Archived from the original on 11 November 2014. Retrieved 14 July 2014. ^ "Andhra Pradesh Secretariat starts functioning from interim government complex at Amaravati". 3 October 2016. Retrieved 23 June 2017. ^ "Chief Minister Chandrababu Naidu inaugurates new Andhra Pradesh Assembly". Retrieved 23 June 2017. ^ "Characterization and Classification of Soils of Northern Telangana". Journal of Tropical Agriculture. p. 24. Retrieved 14 July 2014. ^ "Telangana to have 33 districts from tomorrow". The Hans India. 16 February 2019. Retrieved 17 February 2019. ^ "TSDR-Portal". newdistrictsformation.telangana.gov.in. Archived from the original on 25 August 2016. Retrieved 22 August 2016. ^ Kurmanath, K V (22 August 2016). "Telangana govt to create 21 new districts in Oct". Retrieved 22 August 2016. ^ "Telangana has 44.64 lakh Muslims – GHMC 21 lakh, Khammam only 1.58 lakh". Siasat. 27 August 2015. Retrieved 30 August 2015. ^ "Region-wise distribution of religious groups 2001" (PDF). Table 7.3 in page 393 of SKC report. Retrieved 3 June 2014. ^ "Urdu in Andhra Pradesh". Language in India. Retrieved 22 January 2013. ^ "Census of India 1921, Hyderabad state, Part II" (PDF). Hyderabad state Census. Retrieved 3 October 2017. ^ "Census of India – Distributions of 10,000 persons by language". www.censusindia.gov.in. Retrieved 14 September 2010. ^ "Telangana Legislature website to be available in Telgu, Urdu". The Hans India. Retrieved 27 February 2018. ^ "No Language Wars Here, Hyderabad Metro to Use 4 Languages". News18. Retrieved 27 February 2018. ^ Kulakarṇī, A. Rā (1 January 1996). Mediaeval Deccan History: Commemoration Volume in Honour of Purshottam Mahadeo Joshi. Popular Prakashan. ISBN 9788171545797. ^ "Region-wise distribution of religious groups 2001" (PDF). Table 7.2 in page 381 of SKC report. Retrieved 3 June 2014. ^ "Minority Population Cenus". ANDHRA PRADESH STATE MINORITIES FINANCE CORPORATION. Retrieved 26 June 2014. ^ "Literacy of Rural – Urban (Andhra Pradesh)" (PDF). Government of India. Retrieved 9 May 2014. ^ "A NOTE ON THE BACKWARD REGIONS GRANT FUND PROGRAMME" (PDF). National Institute of Rural Development. Ministry of Panchayati Raj. p. 13. Archived from the original (PDF) on 5 April 2012. Retrieved 14 July 2014. ^ "Agriculture dept. of Telangana". Archived from the original on 9 July 2011. Retrieved 21 August 2014. ^ "Key Sectors of Telangana". Archived from the original on 21 February 2009. ^ "TG Special Economic Zones" (PDF). sezindia. Archived from the original (PDF) on 7 October 2009. Retrieved 3 June 2014. ^ "The Singareni Collieries Company Limited". scclmines. Retrieved 3 June 2014. ^ K. V. Kurmanath. "Telangana will show its might in cotton, maize". The Hindu Business Line. ^ "WELCOME TO GUNTUR DISTRICT OFFICIAL WEBSITE". guntur.nic.in. ^ "Telangana government plans big IT push to rebuild brand Hyderabad". 6 June 2014. ^ Roy, Ananya; Aihwa, Ong (2011). Worlding cities: Asian experiments and the art of being global. John Wiley & Sons. p. 253. ISBN 978-1-4051-9277-4. ^ "An Amazon shot for city". The Times of India. 13 October 2011. Retrieved 13 October 2011. ^ "Special governance for Hyderabad needed for growth". The Times of India. 25 June 2013. Retrieved 25 June 2013. ^ "Huge challenges ahead for new Telangana tourism corporation". timesofindia.indiatimes.com. 9 May 2014. Retrieved 4 June 2014. ^ "Telangana Awarded as Most Promising State of the Year". Country, India. Retrieved 17 October 2015. ^ "TS Bags Promising State of Year Award". New Indian Express. Retrieved 31 October 2015. ^ "SCCL power plant to get new arm". www.telanganatoday.com. 2 April 2017. Retrieved 25 October 2017. ^ "Lay foundation stone for Manuguru power plant". Retrieved 28 March 2015. ^ "NTPC chairman visits thermal power project site". Retrieved 24 March 2016. ^ "Telangana genco seeks yadadri thermal power plant nod". Retrieved 7 August 2016. ^ "It will be TGSRTC from June 2". The Hindu. 16 May 2014. Retrieved 2 June 2014. ^ "citi-Charter". www.apsrtc.gov.in. Archived from the original on 17 September 2010. Retrieved 19 August 2010. ^ "Andhra Pradesh • Natural Advantages". Government of Andhra Pradesh. Archived from the original on 3 April 2009. Retrieved 3 March 2009. 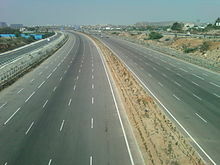 ^ "National Highways in Telangana State" (PDF). Roads and Buildings Department – Government of Telangana. Retrieved 27 March 2018. ^ "History". South Central railway. Archived from the original on 8 January 2016. Retrieved 11 June 2014. ^ "History". South Central Railway. Archived from the original on 8 January 2016. Retrieved 2 June 2014. ^ "More land required for airport at Jakranpally". The Hindu. 7 June 2013. Retrieved 29 July 2014. ^ "About Andhra Pradesh". Hyderabadi search. Archived from the original on 7 June 2014. Retrieved 2 June 2014. ^ "The Templenet Encyclopedia — Temples of Andhra Pradesh". Retrieved 26 February 2009. ^ "Year of success for tinsel town". The Hindu. Chennai, India. 26 December 2007. ^ "The Telugu film industry". Preethi's Web. Retrieved 6 June 2014. ^ "Tollywood loses to Bollywood on numbers – Times Of India". timesofindia.indiatimes.com. 2 October 2010. Retrieved 31 January 2014. ^ "Telugu film industry enters new era | Business Line". Thehindubusinessline.com. 6 November 2007. Retrieved 31 January 2014. ^ "Largest film studio". Guinnessworldrecords.com. Archived from the original on 19 January 2014. Retrieved 31 January 2014. ^ "Rajiv Gandhi University of Knowledge Technologies". Rgukt.in. Archived from the original on 7 October 2011. Retrieved 8 October 2011. Virendra Kumar (1975). "Committee on Telangana surpluses, 1969 – Report by Justice Bhargava". Committees and commissions in India, 1947–1973. 9. New Delhi: D. K. Publishing House. p. 175. ISBN 978-8170221975. Retrieved 11 December 2013. Sarojini Regani (1986). Nizam – British Relations 1724–1857. New Delhi: Concept Publishing Company. ISBN 978-8170221951. Retrieved 11 December 2013. Duncan B. Forrester (Spring 1970). "Subregionalism in India: The Case of Telangana". Pacific Affairs. University of British Columbia. 43 (1): 5–21. doi:10.2307/2753831. JSTOR 2753831. Karen Leonard (May 1971). "The Hyderabad Political System and its Participants". The Journal of Asian Studies. Association for Asian Studies. 30 (3): 569–582. doi:10.1017/s0021911800154841. JSTOR 2052461. "ReInventing Telangana – First Steps- Socio Economic Outlook 2105". Planning Department, Govt of Telangana. Retrieved 24 September 2015. Wikimedia Commons has media related to Telangana.